Posted on December 31, 2014 by ipconcerns Tagged BusinessCorporationEntityIncorporateLLC	CommentsNo Comments on Should You Change Your Business Entity Before the End of the Year? Should You Change Your Business Entity Before the End of the Year? When looking at your end-of-year checklist, you may be asking if now is the best time to change your business entity. It’s actually a great time to do so, especially if you want to start a new year fresh as a corporation. Incorporating now means that you start the new year as a new business structure. You may have operated as a sole proprietor previously, but you’ll start out with a corporation or LLC in the new year. one under your employer identification number. Since no one like filing double the tax forms, why not convert now? Also, some states require that corporations and LLCs pay a franchise tax fee. Converting at the end of the year may equate to savings in franchise tax. This is a fantastic option to ensure that your corporate business structure is ready to roll at the start of a new year. You file your application for a corporation or LLC now and delay the incorporation date until the new year. So if, for whatever reason, you want your corporation to start on Jan. 17 (maybe that’s your business’ anniversary), you have control over that date. As long as your paperwork looks good, you’ll be set to go live with your new business structure on the date you set. A question that is often asked by new inventors is: should I do a prior art search before filing a patent application? The answer, as in most areas of law and life in general, is that it depends. This is the first of 2 parts on prior art searches. In this post I will discuss why you should do a prior art search before preparing and submitting your patent application. In the 2nd part I will discuss how to go about having a prior art search done. For individual inventors and smaller companies including start-ups, I would suggest that you should do a prior art search. Many larger companies have a number of scientists and technologists who are familiar with the technology and what their competitors are doing. They can also absorb the potential risks of not doing a prior art search. Most small entities and start-ups do not and cannot. Even so, a prior art search just makes good sense! Many, if not most, new inventors are convinced that they are the only ones that have thought of the idea that they seek to patent. They believe that they have had a flash of insight that no one else has had. They may even do a bit of Internet research to convince themselves that they are in the clear and that there is no need to do a prior art search. They are often surprised by the results when they do have a search conducted. The risks of not doing a search are several. First, and most importantly, if you plan to commercialize or market the invention as a product or service, you don’t want to get slapped with an infringement lawsuit right out of the gate. These suits are extremely expensive even if you don’t get hit with a large damage award. There is a risk that you will not be able to afford to defend such a suit, and that all of your hard work in developing the invention, getting it through the prototype stage, and getting it to market would be wasted. Usually, there is a significant monetary and time investment involved with these steps. There is also a risk that a court could issue an injunction that would prohibit you from making, using, selling, or offering the invention for sale. Second, conducting a prior art search prior to preparing a patent application may make prosecution of the application more efficient and cost-effective. By knowing the closest prior art, the patent application and the claims may be prepared more strategically to take advantage of areas of patentability. Claims may be prepared that get close to the prior art without encroaching on it. It may be possible to develop arguments and strategies for convincing the patent examiner that the invention is non-obvious. You may find that the invention needs to be reconfigured to “design around” patents that are found. This could add to the value of the invention and potentially give you a competitive advantage. You may find, however, that someone else has a patent that directly prevents you from patenting your invention. In such a case, you may determine whether to abandon your endeavor or seek to partner with or secure a license from the patent holder, or just to try get to market as quickly as possible. The main disadvantages of conducting a prior art search are that it will cost some money and that any material prior art that is uncovered must be disclosed to the Patent Office during prosecution of any patent application that is filed for your invention. The cost is usually not significant in the overall scheme of bringing a new product or service to market and preparing and prosecuting a patent application. In fact, a good prior art search can make these endeavors more efficient. Most patent applicants are looking for strong patent protection in which case it is not a disadvantage to bring prior art to the patent examiner’s attention. This will permit the patent to be “vetted” over that prior art. What is a “patent troll” is a common question as it conjures up all kinds of images and ideas of monsters and overbearing companies. Because there is no universally accepted definition it is sometimes hard to know just what people mean when they use the term. Many people look at a patent troll as a non-practicing entity of a patent that sues for patent infringement, just to make money off the supposed “patent infringer” as a true “patent troll.” If this is your definition then would a university qualify? And are patent trolls always bad? Or are the sometimes good? A lot of people think that a patent troll is always bad, but in addition to being a “pain” to tech companies, patent trolls can also be valuable to tech companies because they foster innovation. Now to answer the question for whether universities are patent trolls, let’s examine what effect a university has on technology. Universities are non-practicing entities, but they contribute to the overall system because the research they do is important to our economy. The Bayh-Dole legislation gives incentive to universities to protect their inventions, and then to license them to businesses, particularly small businesses, who in exchange pay the university, which funds additional research and development. For this reason universities cannot be considered patent trolls, instead they are the image of what we want to foster. In addition, to many, a university would not be a patent troll because although a non-practicing entity, they do not sue others who are practicing the technology. Is suing practicing entities weakening the patent system? Maybe so but if we take only those that are trying to weaken the patent system for their own perceived advantage as patent trolls then universities certainly would not qualify. Does a weakened system foster or hinder innovation? There is no evidence that a weaker patent system fosters innovation, but there is overwhelming evidence that a strong patent system does foster innovation, and this leads to growth, investment from abroad, and a more prosperous economy. Indeed, weak patent rights virtually guarantee innovation simply won’t happen. Where there are weak patent rights, there is no innovation. Innovation must be the core of growth in the U.S. economy, and a strong functioning patent system is a prerequisite. Discoveries lead to inventions, which lead to new technologies, which lead to the creation of new industries, which leads to the creation of high-paying jobs. None of this is possible without significant investment, which only makes sense if you have secured rights, and that is why a strong patent system is absolutely necessary. If it takes a patent troll to get us there, then so be it! ” and gives you plenty to talk about with your friends at this year’s holiday party. Read and enjoy! 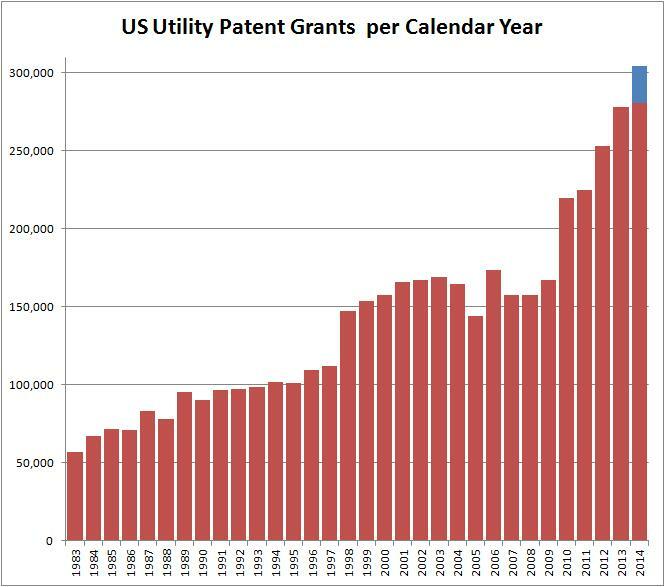 Dennis Crouch keeps up with things like how many patents have issued in the year 2014. Not only does he keep up with them but he plots numbers in interesting ways. If you are interested in things like this, check out his blog PatentlyO from Dec. 6, 2014.